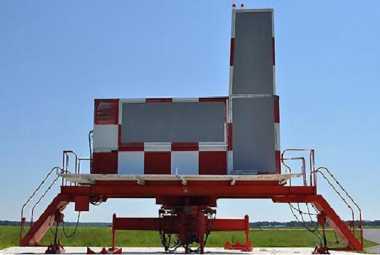 The AN/FPN-63(V) is an X-Band solid-state Precision Approach Radar and can be mounted on a remotely controlled turntable. The AN/MPN-23 is a version of the same equipment mounted on a trailer. This radar provides talk-down capabilities to land military and civil aircraft during reduced meteorological conditions. The coverage of the AN/FPN-63 is 8 degrees in elevation and 20 degrees in azimuth. It allows either a 10 or 20 mile range selection. When MTI is used, the RANGE SELECT switch will choose either 10 or 15 miles. The 5-mile range marks on the AZ-EL scope are brighter than the others. There is also a PAR minimums marker on the elevation scan that marks the decision height (DH) for the runway in use. The AN/FPN-63 has a staggered PRF and an MTI velocity offset control. When echoes of bad weather or blocks of trees show on the scope, you may vary the MTI control to block their echoes. On a PAR approach, the course deviation must not exceed 30 feet or 0.2 degrees, whichever is greater, at the runway threshold. The information of glide slope and centerline deviation is then used by the air traffic controller to guide the pilot for a precision instrument landing. The AN/FPN-63(V) Precision Approach Radar (PAR) is used at naval air stations (NAS) and Marine Corps air stations (MCAS) for air traffic control operations. It replaces the PAR portion of the AN/CPN-4 family of equipment. The AN/FPN-63(V) precision-approach radar has been in use by the U.S. Navy since about 1978, and the system is nearing the end of its useful life.